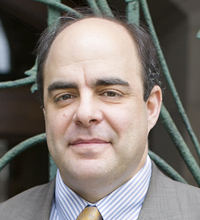 George L. Parsenios is an associate professor of New Testament at Princeton Theological Seminary. He earned his MA (Classics) from Duke University, an MDiv from Holy Cross Greek Orthodox School of Theology, and an MA, MPhil, and PhD from Yale University. His teaching and research explore the interaction of early Christianity with classical literature, as well as the interpretation of the New Testament in the early church. He is the author of two books and several articles. He regularly teaches courses on the Gospel of John, First Corinthians, and Paul the Pastor. Rhetoric and Drama in the Johannine Lawsuit Motif, WUNT 1.258; Mohr Siebeck: Tübingen, 2010. Departure and Consolation: The Johannine Farewell Discourses in Light of Greco-Roman Literature, NovTSup 117; Leiden: Brill, 2005. “‘No Longer in the World’ (John 17:11): The Transformation of the Tragic in the Fourth Gospel,” Harvard Theological Review (2005) 98: 1–21.